As an affluent entity of this domain, we are affianced in offering premium quality array of Dry Ink Batch Coder Machine. This machine is ideal for printing labels on papers, thin cardboard, non-absorbent plastic film and aluminum film with solid ink, characterized by high definition, instant printing & instant dry and strong adhesion. 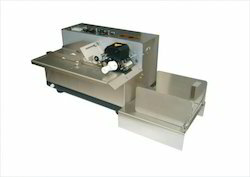 Looking for Dry Ink Batch Coder Machine ?